Looks like you looked into it. For some reason I remember the interlocking tiles having a copyright. I believe that is why the Kickstarter that had new Heroscape-compatible terrain did not use it. Could be wrong though. Also not a lawyer. If that is the case it really opens some opportunities for customs. The present invention is directed to a three-dimensional game board that can be built by a player. The three-dimensional game board may include a plurality of building components having at least one integrally formed hexagonal element, wherein adjacent hexagonal elements share a common side. The hexagonal elements may include a raised hexagonal surface having an edge extending upwardly from a top surface of each hexagonal element. The edges of the hexagonal surfaces of adjacent hexagonal elements may define a channel therebetween. A sidewall may extend downwardly from a peripheral edge and may be defined by the integrally formed hexagonal elements. The sidewall may be configured to be received into the channels formed by the hexagonal surfaces of a building component disposed below. Portions of the sidewall may engage corresponding hexagonal surfaces of the building component disposed below to maintain the building components in substantial vertical alignment. The patent images (sample) are clearly Heroscape tiles, and other images clearly show the interlocking tab-and-cutout structure of the edges, how the tiles fit together, and how they stack. Thanks for this, at first we thought it was the patent we already looked at, but just realized that it is not. We are going to have a lawyer look at it and let us know what we need to change if anything. Thanks again for showing us this before we had a lawsuit on our hands. So we looked into this further, and this is a patent application, but was never granted. I verified this with the patents listed on the Heroscape Swarm of the Marro box (a pretty recent one) and the only patents they have listed are ornamental design patents. Thank you for bringing this to our attention. We really want to make sure we have all our bases covered. Please let us know if you find anything we're missing. We've got some really exciting ideas that we want to pursue that would really add a lot to the game. I looked up this application on PAIR on USPTO.gov, and it shows both a final rejection and abandonment for the patent application. That is probably why they got so many ornamental design patents. The utility patent would have been an issue for our design, but it was rejected. You may have opened the flood gates. That really seems like a missed opportunity for Hyground Tiles and a huge one for you guys and perhaps others. I know I am a little more interested in exploring this now. Digging into it myself, you're correct; the transaction history on the application shows a final rejection on 5/24/06, with a mail notification sent out two days later. The rejection document throws out all of the claims in the application on the basis of prior art and/or obviousness. It appears that we're in the clear for producing tiles that interlock and stack with Heroscape tiles. And it also appears, from a trademark search with USPTO, that the 'Heroscape' trademark was cancelled on 11/6/15, so there's no obstruction to using the term. Awesome. Thanks for the trademark info as well! Happy creating. This makes me SOOO happy!! This is great work digging into this. Indeed @Tornado , a new era has begun! And it's very exciting! The possibilities are endless! Is this room to believe that none of the heroscape terrain designs such as the stackable hex terrain is under copyright and can be 3d printed, and sold? That would open us up to having some new "un"official terrain that could be made and then sold in bulk to fans and it be used in tournaments. No. The ornamental design patents that Hasbro DOES have protect actual heroscape pieces from being reproduced and sold. The design must be sufficiently different in looks and design from the official heroscape pieces. I literally logged in today after getting outbid on those pillars! Lucky to have found this thread. If you would consider selling privately I would be very interested! Im talking about the different sizes of stackable hexes such as a 1 hex 3 hex 7 hex etc. Not the ruins or the trees or things like that. 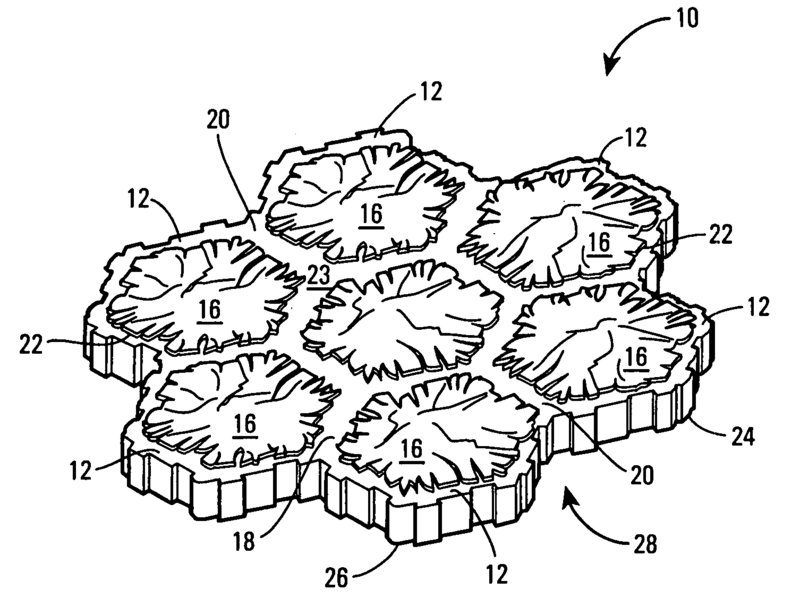 I looked at the patents, and the stackable hexes are what they have patented. I can post references for you when I get time. Sadly, those are still patented. You might argue that changing the pattern on top is enough of a change, but that's too close and I'm steering away from that one.